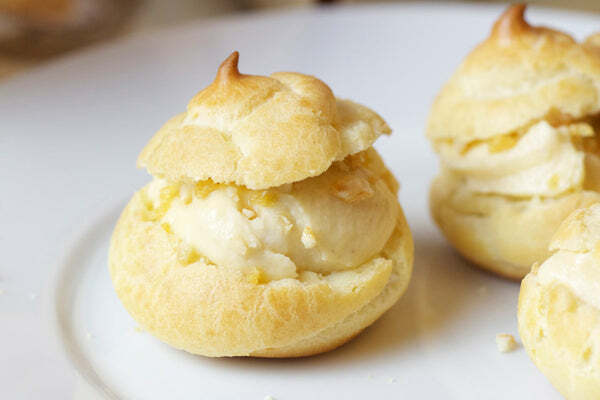 There’s nothing quite as elegant as a profiterole stuffed with light and airy pastry cream. 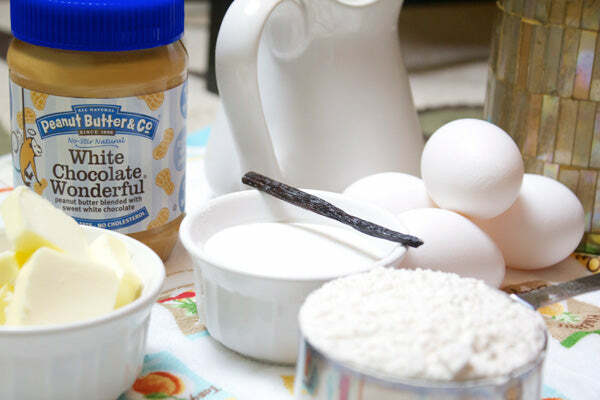 Add smooth, white chocolate peanut butter into that equation and it reaches for divine. They’re not as hard as they look either! 1. In a small saucepan over medium heat, combine the milk, water, butter and salt and bring to a boil. 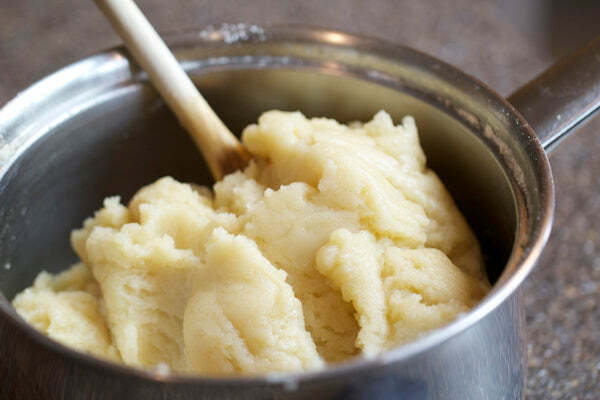 Once the mixture boils, remove it from the heat and add the flour all at once and stir vigorously with a wooden spoon until combined. Return the pan to the heat and continue to cook until the mixture forms a sort of ball, about 3-4 minutes. Remove from heat and let cool until the temperature reaches 140°F. 2. 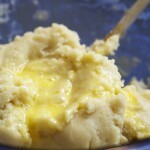 In a small bowl, whisk one of the eggs and beat it into the warm mixture until incorporated. 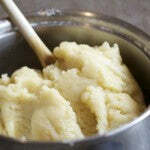 The mixture will separate and then return to a smooth paste as you continue to beat. Repeat with the remaining eggs. Let cool for an additional 10 minutes. 3. Preheat the oven to 425°F and line two pans with parchment paper. Position the two racks in the oven evenly spaced apart. 4. 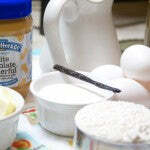 Place the egg mixture into a pastry bag fitted with a large plain tip. Or just use a freezer bag and cut off one of the corners. For each puff, pipe about 2 tablespoons of the mixture into a mound. Space the mounds about 2 inches apart. 5. 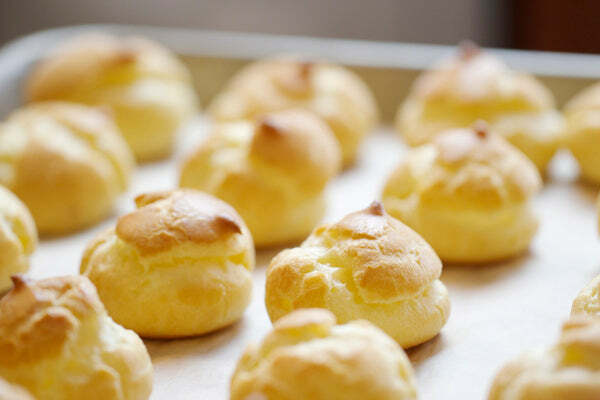 Bake the puffs, two pans at the same time for 15 minutes. After 15 minutes switch the position of the pans and reduce the heat to 375°F. Continue cooking for an additional 10-15 minutes, or until golden brown. Remove from the oven and allow them to cool completely on the pan. 1. In a saucepan over medium heat, warm the milk and vanilla bean until small bubbles appear along the side of the pan. 2. 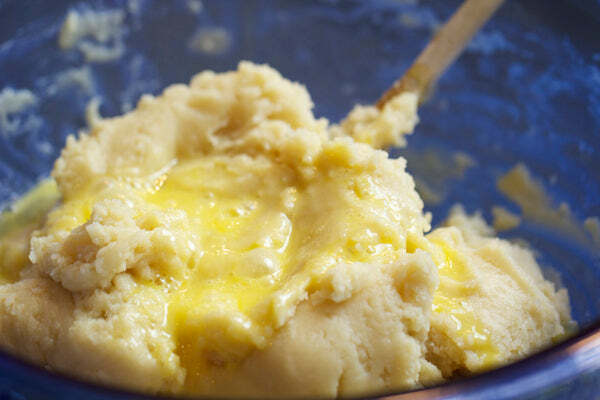 In a bowl, whisk together the egg yolks, sugar and cornstarch until smooth. Slowly whisk in the hot milk until blended. Pour the mixture back into the saucepan and continue cooking over medium heat until mixture comes to a boil and thickens, about 3 minutes. Continue to cook for 1 minute after it begins to boil. Pour the mixture through a fine mesh sieve into a bowl. Stir in the peanut butter. Cover the bowl with plastic wrap, pressing it directly on the surface of the cream and refrigerate until completely cooled. 3. 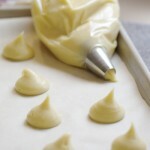 Using a stand mixer, beat the whipping cream until soft peaks form. Fold this whipped cream into the cooled pastry cream. 4. 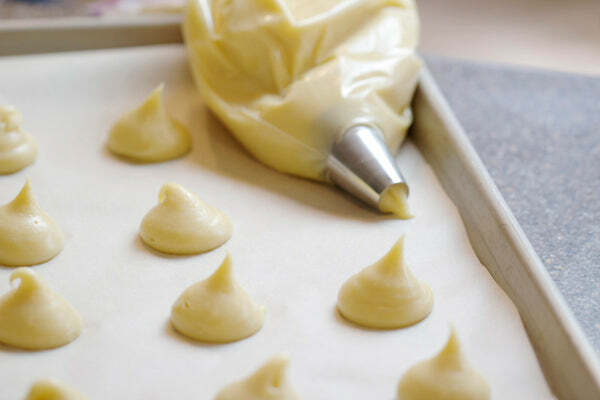 Using a sharp knife, cut the tops off of the cooled profiteroles. Using a piping bag or spoons, add the pastry cream to the hollow interiors, sprinkle with some of the crushed peanut brittle and replace the top. 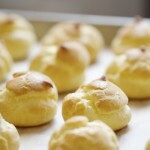 Matt uses his peanut butter pastry cream to fill profiteroles. What other pastries would you use this cream with? – The giveaway is open to USA residents only and will run until Monday, December 24, 2012 at 11:59 PM EST. – Winner(s) will have until 01/04/12 to claim their prize or we will choose another winner. – Winner will win one 16oz jar of White Chocolate Wonderful peanut butter. Product will be shipped by Peanut Butter & Co. 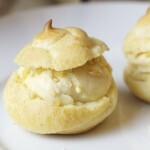 The post Profiteroles with Peanut Butter Pastry Cream appeared first on - Peanut Butter & Co. Recipe Blog.